Annual Membership is just £5 for Juniors, £10 for Adults. Family Membership (2 adults and up to 3 children) is £20. Corporate Membership is available for £100. Congratulations to Port fan Ben Highton who completed the Southport half marathon on Sunday with a time of 2 hours, 19 minutes. This was Ben’s first organised race and he was one of the youngest participants involved. Ben has kindly donated his sponsorship money to Trust in Yellow. Well done Ben and thanks to everyone who sponsored him. Tickets for fans to attend the reunion of the 2005 Conference North title-winning team have now sold out. Tickets ordered by phone can be collected from the Trust in Yellow office at the home pre-season friendlies and further collection opportunities will also be announced by the Trust. The reunion on August 2 will start with a match between the championship squad and a team of supporters, kick-off 2pm at the Merseyrail Community Stadium. Fans without a ticket can attend the match only for an admission fee of £2 on the turnstile. There will be no advance tickets sold for the match only. Please note that a full event ticket is required to attend the post-match reunion in the Grandstand Bar. Fans who have bought an event ticket must bring it on the day to gain entry. The Trust is looking for a couple of volunteers to help at the match with selling programmes and a bucket collection. If you are interested in helping, please e-mail Colin Aindow at caindow@googlemail.com. Southport supporter Ben Highton will be running the Southport half-marathon this Sunday (July 5) to raise funds for Trust in Yellow. Ben will be competing in the 13.1-mile race around the town and has very kindly agreed to donate his sponsorship money to the Trust. Please support Ben as he prepares for the half-marathon by making a donation. You can e-mail fans@trustinyellow.com or donate through PayPal by clicking donate on our homepage and enter Ben’s name in the comments box. Having started running two years ago, this will be Ben’s first organised race and he is set to be one of the youngest participants involved. 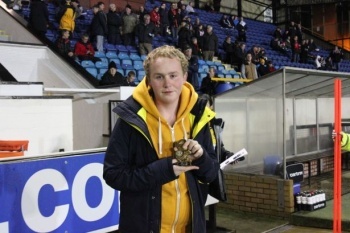 A Southport supporter since season 2002/03, Ben is a programme seller at home matches and travels the length and breadth of the country following the Sandgrounders, rarely missing a game. Recently, Ben has increased his training runs up to ten miles and his target is to complete the half-marathon within two hours. You can read more about Ben's half-marathon HERE. All sponsorships will be gratefully received. All were covered elsewhere on the agenda. Before the discussion got underway Martin placed on record the Trust's thanks to Alan Scarisbrick and Phil Carder for all their efforts in organising the coaches since the Trust's formation. 	The availability of cheap train tickets and the increased freedom of travelling by rail and car. 	The cost of the coach fare. 	Departure times for midweek games being too early for some people who are working. 	Vouchers for a set number of games eg 5  Would allow those who intend to use the coaches regularly to save money and would generate income enabling the Trust to budget more in advance. 	More flexibility after games  Members present were split evenly with some wanting to leave immediately after the match and some wanting to stay for a drink. 	Prioritise popular destinations  Taking into consideration when running a special offer how popular the destination is and not just with the most local fixtures eg Kidderminster may be more popular than Gateshead. 	More pick up points  eg The Liverpool area (when travelling to Wrexham or Tranmere) and Manchester area. 	Ensuring the cheapest possible price  Requests for quotes will once again be sent to several local companies. Some companies are more eager for one off big games such as Derby. 	Pricing and Incentives - Ideas were put forward about the pricing structure for members in general and junior members in particular. Also some ideas for offering incentives for regular travellers. All of these points and suggestions will be discussed at the next Board meeting along with any other suggestions received in the meantime which are always welcome. The Trust's current available funds stand at £28,707.66. This figure includes £500 which has been received for the 2005 Reunion and members were reminded that £25,000 of this figure is set aside for the floodlights project. A quiet time of the year but a busy period is expected shortly with many renewals due in August. The Trust's target is to reach 250 members over the course of the season with membership currently standing at 210. There are currently 12 players in the Trust team to face Churchtown CC on Sunday 26th July. The match will be 20 overs and there are still spaces left for substitutes and reserves. Arrangements for the 2005 Reunion are progressing well with all places on the supporters' team sold out in a day. The response from the 04/05 squad has been excellent with 16 having confirmed their attendance to date. The training sessions held by Richard Brodie have been very popular and volunteers are being sought to help with the running of the event on the day. There will be a Meet the Manager session on Saturday 1st August following the friendly against Bolton which will be held in the Grandstand Bar. Noel outlined to members present the Trust's calendar of events for next season with one event taking place after the first home game of each month. 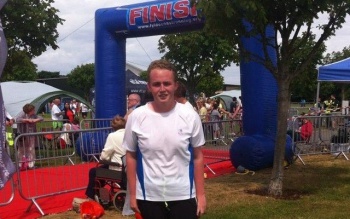 Ben Highton will be running the Southport Half Marathon on Sunday 5th July to raise money for the Trust and all supporters are encouraged to donate. The Trust intends to hold one of its events next season as a tribute to Mark 'Batman' Heaton who sadly passed away recently. The Prediction League for 15/16 has been launched and this time there will be no random entries. Congratulations went out to Nicola Hudson on her new role with Supporters Direct. For some reason, there was no output in the shownews.php file. Either (a) no articles are active, or (b) the template that is being used is empty.